Manage with ease : Manage your multifunction printer with DellTM Open Printer Driver (OPD) and the Dell OpenManage Printer Manager (OMPM) utility. Take advantage of all the enhanced features of the Dell Mono Multifunction Printer - B2375dnf with the assurance that your documents and communication are secure from start to finish. Keep sensitive documents private using the Secure Print feature. Print jobs are not released until a 4-digit PIN is entered on the printer control panel. Scan and convert files to Secure PDFs with up to 128-bit Secure PDF encryption. Secure your data transmission with SNMPv3 and IPV6 protocols with IPsec authentication and encryption as well as IEEE 802.1x network access control. Guard against unauthorized access with secure walk-up user authentication and Lightweight Directory Access Protocol (LDAP) with Kerberos authentication. Speed up the scanning and printing process, for large and small jobs, with enhanced usability and management features designed to promote office efficiency and collaboration. Personalize the 4.3" color touch screen with customized user settings. Preview scanned files directly from your touch screen before printing or sharing. Scan and share digital content to a variety of scan-to destinations - email, PC, network, FTP, fax server, Web Services for Device (WSD) and cloud services Microsoft SharePoint Online and Google DriveTM. Scan large documents quickly thanks to the 50-page Duplex Automatic Document Feeder (DADF) that scans both sides of each page automatically. Conveniently store and retrieve templates and frequently used forms on the printer with up to 3GB of built-in accessible storage. Print or scan directly from a USB flash drive using the front USB port. Monitor, manage and create reports for the printers on your network with the Dell OpenManage Printer Manager v2 (OMPM). Simplify driver deployment and setting changes with the Dell Open Printer Driver (OPD). With a low cost-per-page and total cost of ownership, the versatile Dell Mono Multifunction Printer - B2375dnf offers tremendous value. Print fast with 40ppm (letter) / 38ppm (A4)*. Handle high-volume printing reliably with a duty cycle of up to 100,000 pages per month*. Maximize network performance with Gigabit Ethernet connectivity for fast data transfers. Reduce paper consumption by up to 50 percent with two-sided printing. 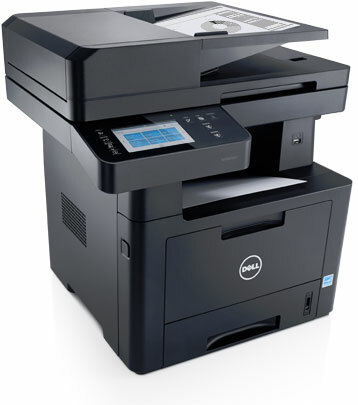 The Dell Mono Multifunction Printer - B2375dnf also supports printing on recycled, renewable content and chlorine-free paper. Designed with the environment in mind ,this printer is registered EPEAT in the U.S. and Canada and is ENERGY STAR qualified* as well as RoHS compliant*. Complete your printer experience with a high-yield toner cartridge and additional 520-sheet paper tray. Get sharp printouts while reducing your cost per page with the optional high-yield 10,000-page* black toner cartridge. Bring the total paper capacity of your Dell Mono Multifunction Printer - B2375dnf to 820 sheets with this optional 520-sheet paper tray.